Home » »Unlabelled » I LIVE IN YOUR BASEMENT! I told that to my friend Jeremy Goodman as we trotted to the playground behind our school. I nodded and picked up the pace, keeping side by side with Jeremy as we crossed Fulton Street. I didn’t laugh. It wasn’t funny to me. I’m twelve years old, and my mom treats me like some kind of baby. She’s always warning me about everything I do. She drives me crazy. She constantly thinks up new ways I might hurt myself or do some kind of damage. She’s also the world’s expert on germs. According to Mom, everything you touch or see will give you germs. Mom is always on guard duty. Always alert. Always ready to step in and warn me about something. It makes my life a little hard. She doesn’t like for me to play softball with my friends. She’s sure I’ll break my leg. That’s if I’m lucky. If I’m unlucky, I’ll break every bone in my body. Do you know how hard it would be to break every bone in your body? My mom is the only person in the world who thinks people do it every day of the week! That’s why I had to sneak out of the house to go play softball at the playground with Jeremy and some other kids from my school. It was a warm, sunny day. The green lawns along Fulton Street all glowed in the sunlight. The air smelled fresh and sweet. It felt so good to be jogging down the sidewalk with Jeremy, looking forward to playing a game, laughing and spending time with friends. School had let out early because of some kind of teachers’ meeting. I hurried home and dropped off my backpack. The house was empty, except for Tyler, my dog. He’s part cocker spaniel, part we-don’t-know-what. Tyler was happy to see me. He licked my face. Mom doesn’t like it when I let Tyler lick my face. You know why. The terrible “G” word. Mom was out shopping or something. I guess she forgot that I’d be home early. Such a lucky break. I changed into a ragged pair of jeans and a T-shirt. Then I grabbed my baseball glove and hurried out to meet Jeremy before Mom returned home. “Marco, what would your mom do if she caught you playing softball?” Jeremy asked. “My parents never warn me about anything,” Jeremy said. “That’s because you’re perfect!” I teased. Jeremy slugged me on the arm. Actually, I wasn’t teasing. Jeremy is perfect. He gets all A’s in school. He’s good at sports. He takes care of his little sister. He almost never gets in trouble. He doesn’t touch anything with germs. We passed the bus stop and crossed Fairchild Avenue. Our school came into view. It’s a long, one-story building that stretches in a straight line for nearly a whole block. The walls of the school are painted bright yellow. As yellow as an egg yolk. Mom says they discuss the color a lot at Parent Association meetings. No one likes it. Jeremy and I jogged through the teachers’ parking lot to the playground behind the building. The softball diamond stood behind the row of swings. A bunch of kids were already there. I recognized Gwynnie Evans and Leo Murphy. The Franklin twins were arguing as usual, standing nose to nose, screaming at each other. They’re weird guys. You can never put them on the same team. He took off across the grass. Leo and some of the other kids called out to us. I slowed to a walk, breathing hard. Jeremy is a lot better athlete than I am. Gwynnie stood on the pitching mound, swinging two bats and talking to Lauren Blank. Gwynnie is always trying to prove that she’s better in sports than any of the boys. She’s big and strong. She’s at least half a foot taller than me, and she’s got much bigger shoulders. She’s always pushing kids around and acting tough. No one likes her. But we always want her on our team because she can hit the ball a mile. And if some kind of argument breaks out, Gwynnie always wins it because she can yell the loudest. “Let’s get started,” Jeremy declared. I took off running to the pitcher’s mound. Gwynnie dropped one of the bats to the ground. She had the other one in her grip. I guess she didn’t see me. As I ran up to her, she pulled the bat back—and swung it with all her might. I saw the bat move. But I didn’t have time to duck or move out of the way. The bat made a loud THUNK as it slammed into the side of my head. At first, I didn’t feel a thing. But I still didn’t feel anything. Then the pain exploded in my head. So bright, I had to shut my eyes. I heard myself shrieking. Neighing like a horse. A shrill wail I never heard before. And then the ground flew up to swallow me. I woke up staring at the ceiling. A blue ceiling light—blue as the sky—blurred then sharpened, blurred then sharpened above me. Mom’s face floated into view. I blinked once. Twice. I knew I was home. Mom’s eyes were red and wet. She had her black hair pulled back tightly. But several strands had fallen loose and hung down her forehead. My head ached. Everything ached. I’ve done it, I thought. I’ve broken every bone in my body. Something was sitting on my head. Weighing me down. Tyler? Why was the dog sitting on my head? My arms ached as I slowly raised my hands to my head. And felt a bandage. A heavy bandage. I lowered my hands. The room began to spin. I gripped the couch cushions, holding on for dear life. I stared up at the blue ceiling light until it came into focus. The den. I was lying on the soft leather couch in the den. Talking made my throat hurt. “Yeah. I can see,” I whispered. She wiped one eye with a tissue. Then she stared at me some more. “I can see fine,” I told her. Please don’t say, I told you so! I thought. I crossed my fingers, even though it hurt to cross them. And I prayed. Please don’t say I told you so. Mom’s expression changed. She frowned at me. “I told you not to play baseball,” she said. “Of course,” she replied. Her face floated over me for a second, then slid out of view. I didn’t like the way she said it. It sounded false. Too cheerful. I lifted my head. Sharp pain shot down the back of my neck. Mom had vanished from the room. I could hear her putting plates away in the kitchen. I tried calling her. But my voice came out in a hoarse whisper. I lowered my head slowly to the couch cushion and shut my eyes. I guess I drifted off to sleep. The ringing phone woke me up. I blinked up at the blue ceiling light, forcing it to come into focus. The phone rang and rang. I waited for Mom to pick it up. But she didn’t answer it. Did she go out and leave me all alone? I wondered. She wouldn’t do that. Where is she? Groaning, I rolled onto my side and grabbed the phone off the coffee table. I raised it to my ear. I banged it too hard against the bandage over my head. The side of my head throbbed with pain. “Who—who is this?” I stammered. I shut my eyes tight, trying to push away the pain of my throbbing head. “Huh? You don’t?” I murmured. “Uh… thanks.” I kept my eyes shut. The pain pulsed at my temples. It was hard to hold the phone over the heavy bandage. “Who is this?” I demanded again. “I—I don’t know you,” I stammered. Did I hang up? Or did Keith hang up? I’m not sure. I felt very confused, very upset. Keith hadn’t called to be friendly. I knew he was trying to scare me. Was it actually a friend of mine? Someone from school playing a joke? It wasn’t a very funny joke. I stared at the ceiling, feeling groggy and weak. I don’t know how much time passed. I kept picturing Gwynnie standing on the pitcher’s mound. I saw her swinging two bats. Then one. I saw the bat whirling toward my head. “Ohhh.” I uttered a low moan and forced the picture from my mind. “How are you doing, Marco?” a voice whispered. I gazed up at Mom. She had brushed her hair and put on lipstick. She had changed into a bright green T-shirt and a dark skirt. “I didn’t mean that call,” I said. I pulled myself up onto my elbows. My head didn’t throb as badly. The room didn’t spin and tilt. I was starting to feel a little stronger. Mom’s expression changed. She lowered her eyes. “Oh, wow,” she murmured. Mom placed a cool hand on my hot forehead. “I—I’m a little worried about you, Marco,” she said softly. Her chin quivered again. “You’re not thinking clearly, Marco,” she said. “Why? Why do you say that?” I demanded. She narrowed her eyes at me. “There’s no phone in this room,” she said. I woke up early the next morning. I sat up, feeling alert. Refreshed. Before I even stood up, I knew I was a lot better. My head didn’t throb. My muscles didn’t ache. I took a long shower. The water felt so crisp and sharp on my skin. I was drying myself when I realized I no longer had the bandage on my head. I spotted it on the floor by my bed. I guessed it had fallen off during the night. Stepping up to the medicine chest mirror, I checked out the damage. Not too bad. I had an ugly purple bruise on my right temple. It had swelled up like a giant mosquito bite. But the rest of my head had its normal shape. I winked at myself. My eyes seemed sharp and clear. I let out a loud cheer. My throat didn’t hurt. I was so happy to be feeling strong again. I pulled on a pair of baggy jeans and a sweatshirt. And I hurried down to the kitchen for breakfast. That was a new one! “I’m starving!” I cried. I poured myself a big bowl of my favorite cereal combo—Frosted Flakes and Corn Pops, all mixed together. I grabbed a spoon and began gobbling hungrily. I’d heard that one before. “Guess you’re feeling better,” Mom said. She smiled at me and squeezed my hand. “You always want me to stay in,” I grumbled. “I’ll stay in,” I promised. A loud THUD THUD made me jump. “What was that?” I yelped. “I said I won’t go out,” I groaned. Jeremy came into the kitchen. He stopped halfway across the room and stared at me. “Are you alive?” he asked. I pinched my arm. “Yeah,” I told him. “Don’t pinch yourself. You’ll make a bruise,” Mom warned. Jeremy didn’t come any closer. He stood in the middle of the kitchen and stared at me. When she disappeared, Jeremy turned to me. “You really okay?” he asked. I nodded. “Yeah. I don’t feel bad at all.” I finished the last of the cereal and poured myself a glass of orange juice. “I feel a lot better than yesterday,” I declared. We talked about the accident for a while longer. Then I asked Jeremy if he wanted to feel the purple bump on the side of my head. “Hey—no way!” he cried, making a sick face. I knew that would gross him out. He helped me put away the breakfast stuff. “What do you want to do?” I asked him. “Your mom said you can’t go out,” Jeremy reminded me. “So we’ll stay in,” I replied. “Want to play pool?” he suggested. We have a pool table in our basement. It’s a regulation-size table, and there isn’t quite enough room for it. You have to tilt your pool cue up and play around the concrete beams. “Yeah. I’ll play you,” I agreed. He’s a much better pool player than I am. But sometimes I get lucky and beat him. I finished shoving the breakfast dishes into the dishwasher. Then I led the way to the basement door. I reached for the doorknob—then stopped. I live in your basement. I remembered the boy’s voice on the phone. So flat and cold. You’re going to take care of me from now on…. I live in your basement. His words came back to me. They made me hesitate at the door. But I only imagined that call, I told myself. There was no boy. No voice. No Keith. I imagined it because I got hit on the head. I pulled open the door. I gazed down the basement steps. Then, gripping the banister, I led the way down. As soon as I reached the basement, I ran around turning on all the lights. Even in the laundry room. “I like a lot of light,” I told him. I peeked behind the big stack of cartons near the furnace. Then I squeezed behind the furnace to see if anyone was living back there. Nothing but a tall mountain of dust. I was beginning to feel a little silly. Why would anyone be living in my basement? The whole idea was crazy. I trotted over to the pool table and picked out a cue. Then Jeremy and I began to play. He sank the three ball in a side pocket. On his next shot, balls clattered all over the table. But nothing dropped in. My turn. I had to squeeze between the table and a concrete pole and tilt the cue up toward the ceiling. Not an easy shot. “Did you ever play pool with Gwynnie?” Jeremy asked, moving around the table to find his best shot. “Maybe she thinks she has to hit a home run!” I joked. We both laughed. Laughing made the side of my head hurt. Thinking about Gwynnie made my head hurt! Jeremy bounced the seven ball into the eight ball. The eight ball almost dropped into a corner pocket. “That was close!” He sighed. Maybe you don’t know the rules of pool. If the eight ball goes in, you lose. That’s the only way I ever beat Jeremy. “Nice,” I murmured. I hit the twelve ball a solid shot, but it didn’t go in. “Why do you think the Franklin twins fight all the time?” I asked. “That’s very deep,” I replied. I wanted to think about that. But a strange sound made me spin away from the table. A scratching sound. Very close. A scratch. Then a BUMP. “Did you hear that?” I whispered to Jeremy. He nodded. “Yes.” He pointed to the stairs. We have a large pantry cabinet under the stairwell. The noises were coming from inside the cabinet. We both stared at the wooden cabinet door. I made my way over to the cabinet door. “Who’s in there?” I called. A scraping sound. Someone right behind the door. “Who is it?” I repeated. I grabbed the cabinet door. Took a deep breath. Tugged it open. And screamed as a creature leaped out at me. Yes. A fat gray squirrel jumped from the closet—onto my leg. It fell off. Hit the floor, its eyes wild, its legs thrashing the air. Sliding on the linoleum, it took off across the basement. “How did a squirrel get in there?” Jeremy asked. I was still too startled to reply. I watched the squirrel try to climb one of the concrete beams. It slipped off, turned, and ran toward the laundry room. The squirrel was staring back at us from the laundry room door. “Get him!” I cried. Jeremy and I chased after the squirrel. It darted around the laundry room. Behind the dryer. Nowhere to run now. “I’ve got it!” I shrieked. I stretched out my hands and made a wild dive. But the squirrel scampered right over my back. Dodged past Jeremy. And raced back into the main room. My head started to throb. I was breathing hard. I darted out of the laundry room. The squirrel ran under the pool table, its bushy tail standing straight up. I checked to make sure both basement windows were open. Then I grabbed an old fishing net from against the wall. The frightened animal stopped running and turned back to Jeremy and me. Its whole body trembled. Its little black eyes pleaded with us. I swiped the net at it. Missed. The squirrel took off. Jeremy dove for it. He missed too. As we watched helplessly, the squirrel jumped onto the pile of cartons by the furnace. Climbed to the top. And leaped out of the basement window. “Yesssss!” Jeremy and I both cheered and slapped each other a high five. “Victory over all squirrels!” Jeremy boomed in his deepest voice. I didn’t know what that was supposed to mean. But we both burst out laughing. Mom’s voice from the top of the stairs cut our laughter short. “What’s going on down there?” she called. Jeremy and I played a few games. He beat me easily each time. But we had fun. And we didn’t poke out any eyes. Mom made us sandwiches and chicken noodle soup for lunch. She kept warning us to blow on the soup or else we’d burn the skin off our tongues. After lunch, I started to feel tired. So Jeremy went home. “I didn’t overdo it,” I grumbled. But I went upstairs and took a long nap. Too long. Late that night, I couldn’t get to sleep. I felt wide awake. I read for a while. Then I did a little channel surfing, but I didn’t find anything good to watch. I glanced at my bed table clock. A few minutes after midnight. My stomach growled. Maybe I need a midnight snack, I decided. I clicked on the hall light and made my way downstairs to the kitchen. But I didn’t get as far as the kitchen. To my surprise, the basement door stood open. “Weird,” I muttered. Mom always keeps that door closed. She’s a nut about keeping doors shut. I walked over to the door. And started to push it closed. But I stopped when I heard a scraping sound down there. I poked my head into the opening and peered down into the darkness. “Who—who’s down there?” I called. I heard more scraping steps. The words burst from my mouth. My cry sounded shrill and frightened. I heard more footsteps on the linoleum floor. Then the basement light flashed on. And I stared down at—Mom! “Marco—why aren’t you asleep?” she demanded, frowning up at me, hands at her waist. She squinted up at me. Tilted her head, examining me with her eyes. “What do you mean?” she asked softly. “Mom—I’m not imagining it!” I wailed. “Mom—did you hear that?” I shrieked. “Hear what?” Mom demanded, eyeing me sharply. “The boy—” I started. But I didn’t finish. Someone bumped me hard from behind. I stumbled toward the basement—and nearly fell down the stairs. “Whoa—!” I let out a cry and spun around. Tyler wagged his tail at me. He shuffled forward and bumped me again. He does that all the time. Just to be friendly, I guess. Tyler stopped wagging. He stared up at me with his big brown eyes. I decided not to argue. What was the point? I glanced down into the basement, hoping to catch a glimpse of the boy. But I saw only darkness. Where was he? Where was he hiding? I knew I hadn’t imagined him. I knew I had really heard him. Mom let me go to school on Monday. The way things turned out, I wished she had kept me home. I felt fine. The bump on my head was still purple. But it had shrunk to about the size of a quarter. When I went into the school building, everyone ran up to me. The Franklin twins were arguing about which backpack was whose. They are always getting their stuff mixed up. But when they saw me, they dropped both backpacks and hurried over. Everyone laughed and joked and made a big fuss over me. I enjoyed being the center of attention for once. Usually, no one pays any attention to me at all! I was feeling pretty good about things. Until the bell rang and Miss Mosely asked me to come up to the front of the class. “I think we’re all glad to see you in school today, Marco,” she said. Jeremy started clapping, and then everyone else clapped. Even Gwynnie, who sits right in front of the teacher. I stared at her. My brain did a flip-flop. My mouth dropped open. Had I been in the hospital? I blinked. Thinking hard. Trying to remember. “Tell us everything,” Miss Mosely insisted. She crossed her arms and stared at me through her round, black-framed eyeglasses, waiting for me to talk. “I—I don’t remember,” I stammered. One of the Franklin twins laughed. A few kids whispered to each other. “Well, what do you remember about the hospital, Marco?” Miss Mosely asked, speaking slowly and clearly as if talking to a three-year-old. “I don’t remember anything. Nothing at all!” I blurted out. Meanwhile, I was still standing up there in front of everyone. Feeling awkward and confused. Why didn’t I remember the hospital? The first thing I remembered, I was lying on the den couch at home. Up till then, I didn’t know it had left. I dropped into my seat, feeling weak and shaken. I was still thinking hard that afternoon as I started walking home. Still trying to remember something about the hospital. I saw some kids starting a softball game on the playground diamond. Thinking about softball gave me a chill. I started to turn away—but someone caught my eye. She came chasing after me across the grass. She carried a baseball bat, raised high over her head. She had a grim, determined look on her face. “Marco! Hey—Marco!” she called, waving the bat menacingly. She’s going to hit me again, I knew. “No—!” I let out a cry. And gaped at her in horror. Gwynnie had a fierce look on her face. She swung the bat over her head again. I froze. My legs refused to move. With a loud cry, I finally managed to turn away. And I started to run. I hurtled across the street without checking for traffic. What is her problem? Is she crazy? I asked myself. Why is she doing this? Did Gwynnie really think she could bring back my memory with a smack on the head? I turned the corner, breathing hard, the backpack bouncing on my shoulders. Glancing back, I saw her on the other side of the street. Two school buses rumbled by, forcing her to wait. I lowered my head, shifted the backpack, and forced myself to pick up speed. By the time I reached home, my heart pounded so hard it hurt. And the bump on my head throbbed with pain. I dove into the house and slammed the door behind me. Then I pressed my back against the door and struggled to catch my breath. “Marco? Is that you?” Mom called from the den. Still gasping for breath, I tried to choke out an answer. But only a low croaking sound escaped my throat. “Okay,” I managed to murmur. “We… didn’t… have… gym,” I gasped. Mom was always giving me notes to excuse me from gym. She was sure I’d poke my eye out or break every bone in my body in gym class. “Really. I’m fine,” I said, starting to feel normal again. I slipped out from under her hand and peeked out the front window. Had Gwynnie chased me all the way home? I didn’t see her out there. I wanted to ask her about the hospital. But I didn’t want her to know that I’d lost my memory. It would only cause a lot more trouble. “No thanks,” I replied. I climbed the stairs and hurried down the hall. And let out a startled cry when I saw a boy sitting on my bed. He looked about my age. He had wavy black hair around a thin, serious face. He gazed at me with round dark eyes. Sad eyes. He wore black denim jeans and a loose-fitting plaid flannel shirt. He didn’t appear at all surprised to see me. “Who—who are you?” I stammered. I didn’t say anything. My mind went blank. I stared at the boy from out in the hall. My knees suddenly felt weak and trembly. I grabbed the sides of the doorframe to keep from falling. I stood there frozen for a long moment. I pulled the bedroom door shut. It had a key and a lock, which we never use. My hand trembled as I grabbed the key and turned it. Yes! I had locked Keith in. He was trapped inside my bedroom. Now Mom would see him. Now she would have to believe me. No. She was probably in the kitchen starting dinner. I tested the door again, making sure it was locked tight. Then I plunged down the stairs, calling to her. “Marco? What on earth—?” She came running from the kitchen, carrying an onion and a knife. “I’m not crazy!” I wailed. I grabbed her arm again. The onion fell out of her hand and bounced across the floor. She grumbled, but she followed me up the stairs. I stopped outside my room and reached for the key. My heart pounded so hard, I thought my chest might explode. My head started to throb. I turned the key. And pushed open my bedroom door. “There!” I declared, pointing to my bed. Mom and I both let out cries of surprise. Tyler sat staring at us from the bed. He panted loudly. His tongue hung out. When he saw us, his tail started to wag. “No. Wait,” I insisted. I ducked out from under her grip. I spun around. Where else could he be hiding? Tyler leaped off the bed and bounded from the room. “That poor dog doesn’t like being locked up,” Mom fretted. She tsk-tsked. “You’re going to be fine, Marco. Really you are.” Her voice trembled. It was easy to figure out what she really meant: That hit on the head scrambled your brains, Marco. You’re acting like a total nutcase! “I’m going to phone Dr. Bailey right now,” Mom replied. “But I don’t want you to worry. Everything will be okay.” She hurried from the room. Everything will be okay. Mom’s words lingered in my mind. As usual, she was wrong. Dr. Bailey’s waiting room was all blue and green. A huge fish tank against one wall bubbled quietly. The blue and green chairs, blue and green carpet, and blue and green walls made me feel as if I were in a fish tank too! Mom and I checked in with the woman behind the desk. Then we sat down on a hard plastic couch against the wall. On the plastic chairs across from us, a girl sat with her father. The girl was about seven or eight. Every few seconds, she hiccupped loudly. Her whole body shook with each hiccup. “She’s been doing that for two weeks,” her father explained, shaking his head. The man stared at Mom. The girl hiccupped and shook. I felt as if I were swimming with the fish. Floating through thick blue water. But I can’t breathe underwater! I told myself. “Try holding your breath,” her father instructed her. “I’ve been holding it for ten days!” she grumbled. Several hundred hiccups later, the nurse led Mom and me into Dr. Bailey’s office. As I stepped inside, I saw that his office was blue and green too. The doctor was a cheerful, chubby man. He had a round face, a shiny, bald head, and he wore a bow tie under his green lab coat. The bow tie bobbed up and down on his Adam’s apple when he talked. He came around the desk to shake hands with me. Then he used his thumbs to pull up my eyelids so that he could examine my eyes. “Hmmm… looks okay,” he murmured. I hesitated. Should I tell him about Keith? If I do, will he think I’m crazy too? Will he send me back to the hospital or something? Should I tell him I don’t remember anything about being in the hospital? Dr. Bailey gazed at me patiently, waiting for me to begin. Finally, I decided, okay, I’ll tell him everything. He’s a doctor, after all. He will understand. So I told him I couldn’t remember the hospital. And then I told him about the boy who said he lived in our basement. And I told him about actually seeing Keith. And locking him in my room. And finding Tyler. The whole story. I told him everything. It felt good to tell it. Dr. Bailey sat behind his desk and kept his eyes locked on me the whole time. His bow tie twitched on his Adam’s apple. But he didn’t say a word until I finished. Then he leaned forward and sighed. “It doesn’t sound too bad,” he said. “Oh, thank goodness!” Mom exclaimed. Dr. Bailey scratched his bald head. “But do you know what I would like to do just to make sure everything is okay?” he asked. “What?” Mom and I said together. “I’d like to remove your brain and examine it under a microscope,” Dr. Bailey said. “Huh?” I gasped. I nearly fell out of my chair. “It isn’t a difficult operation,” Dr. Bailey said, flashing me a calm, reassuring smile. “Once I crack the skull open, the brain slides out easily,” the doctor explained. “I—I don’t think so,” I protested. Dr. Bailey leaned farther across the desk. His face loomed so close, I could see tiny beads of sweat on his forehead. “It won’t hurt much,” he said. I turned to Mom. “You’re not going to let him do it—are you?” I demanded. I jumped up from my chair and darted for the door. I didn’t wait for Mom. I didn’t say good-bye. I just ran. Mom followed me into the waiting room. “Marco, that was really rude of you!” she scolded. “I’d like to keep my brain,” I replied angrily, and kept walking to the office door. As we passed, I said good-bye to the girl with hiccups. “Hic Hic Hic,” she said. I think her problem was getting worse! “Doctors know what’s best,” Mom said, hurrying across the parking lot after me. Mom said not to worry about losing my brain. She said we’d wait a few days before deciding what to do. That night, I was writing a homework assignment on my computer. Miss Mosely had given us a creative writing assignment. We had to write a story from someone else’s point of view. I decided to write about a typical day from Tyler’s point of view. It was fun to try to get inside the mind of a dog. A dog has an IQ of ten. That’s what I learned on one of those science shows on TV. A ten IQ isn’t very smart. You can’t figure too many things out with an IQ of ten. That’s why Tyler always looks confused and surprised. That’s why he can spend ten minutes barking at a plastic trash bag. I leaned over my keyboard, typing away. I was enjoying myself. I don’t usually like to write papers, but this was a fun assignment. When the phone rang, I groaned and kept typing. I waited for Mom to pick it up downstairs. But she didn’t. I stood up and walked over to the phone on my bed table. A chill froze the back of my neck. Was it him? Was it Keith? I remembered the first time he had called. The day I’d been hit on the head. My hand grabbed the phone, but I didn’t pick it up. I couldn’t decide what to do. I didn’t want to talk to him again. I wanted him to disappear. We talked and laughed about stuff for a while. Talking to Jeremy cheered me up. I was starting to feel really normal again. “I’d better get back to work,” I said after a few more minutes. I set down the phone and crossed the room to my computer. I started to sit down—but stopped when I saw the monitor screen. My writing—my words—had all disappeared. A face stared out at me from the screen. “No—!” I let out a cry. And a powerful arm slid around my neck from behind. And began to tighten around my throat. The arm tightened around me. I tossed up my hands. Spun around hard. “Huh?” My mouth dropped open. “Yes. I remember,” I said, rolling my eyes. “Then why were you carrying the bat?” I demanded. “Well…” I didn’t want to tell her that was exactly what I thought. She’d tell everyone in school that I was afraid of her. Everyone would have a really good laugh about what a ’fraidy cat Marco is. How I ran away from someone who only wanted to apologize. She sighed. “I—I was so scared. You just lay there on the grass. You didn’t move. I—I thought…” She glanced away. I nodded. Then I remembered Keith. Gwynnie gazed at the monitor. When she turned back to me, her expression was confused. I turned to the monitor. Black. The screen was black. Gwynnie walked across the room and leaned against the window ledge. She crossed her arms in front of her. “That was a joke—right?” she demanded. I couldn’t take my eyes from the screen. Had I imagined the face? No! I saw it there. I’m not crazy! I told myself. Gwynnie narrowed her eyes at me. She didn’t say anything. I could see her studying me. An idea flashed into my mind. Gwynnie is a lot braver than I am, I told myself. She’s bigger than I am. And she’s meaner and stronger. If we find Keith down in the basement, I’ll feel a lot safer if Gwynnie is around. “This is dumb,” she said finally. “I should get home. I haven’t even started the creative writing assignment.” She headed for the door. I knew that would get her. I led the way to the basement stairs. Then I pulled open the door and clicked on the light. I peered down the wooden stairway. Nothing to see down there. But I felt a chill of fear, anyway. “You go first,” I told Gwynnie. Our sneakers thudded on the wooden steps. The air grew colder as we made our way down. Mom is always complaining that we have no heat in the basement. Gwynnie led the way, moving quickly. My hand gripping the banister, I hurried to stay close to her. At the bottom of the stairs, I stopped short to keep from bumping into her. We both glanced around the main room. A ceiling light had gone out. Half the room was hidden in deep shadows. I heard the DRIP DRIP DRIP of a faucet, coming from the laundry room at the far wall. The sound of heavy breathing made me gasp. Then I realized the sound came from Gwynnie. I crept up beside her. And listened. I shuddered. He was down here. I knew he was. Why wasn’t Gwynnie afraid? A sudden sound made me jump. My eyes moved up to the ceiling. Gusts of wind were rattling the basement windows. I stopped to listen to another strange sound. A mouse? No. Just Gwynnie’s sneakers squeaking over the linoleum floor. We moved deeper into the room. I stepped up to the pool table. I peered underneath. Gwynnie pulled open the pantry door beneath the stairwell. She clicked on the light and searched the shelves. We made our way across the room. The furnace stood in the dark part of the room. It rose up in front of us like some kind of gigantic creature. Her voice echoed off the dark walls. Outside, the wind howled, rattling the windows. “Hey—wait up!” I whispered. I didn’t want Gwynnie to get too far ahead of me. The smell of mothballs floated out. Gwynnie slammed the closet door shut. “Keith? Don’t be shy, Keith!” she called. We peered behind the furnace. No one hiding back there. “The laundry room is the only room we haven’t searched,” I told her. “I’ll bet he’s hiding in the dryer,” Gwynnie teased. I knew she wasn’t taking me seriously. But I didn’t care. I was glad to have her down there with me. I never could have searched the basement on my own. I followed her toward the laundry room against the wall. We were halfway across the floor when she stopped suddenly. “Huh?” My heart leaped. I let out a gasp and spun around. And stared at my mom’s old clothing dummy. My whole body was shaking. “You’re not funny!” I managed to choke out. I tried to punch her. But she dodged away from me, laughing hard. “And you thought I was just trying to pay you back for hitting me on the head?” I asked shrilly. She nodded. “You want to go to school tomorrow and tell everyone how you scared me,” Gwynnie accused. “No. You’re wrong. Listen to me—” I pleaded. “No way,” she interrupted. She turned and headed toward the stairs. “Gwynnie, listen—!” I begged, chasing after her. She stopped at the bottom of the stairs and turned back to me. “You can’t scare me, Marco,” she said. Her eyes caught the light from the stairwell. A strange smile spread over her face. “I’ll show you something,” Gwynnie said. She placed both hands on the wooden banister. Then she opened her mouth. Wide. Her mouth stretched open. Wider… wider. Until the rest of her face disappeared behind her open mouth. Her tongue plopped heavily over her chin. And then something pink began to pour out. Something pink and glistening wet rolled out from the gaping mouth. More… more… swelling as it poured out. At first, I thought she had a big gob of bubblegum in there. But as the pink gunk flowed up from her throat, the mouth pulled open even further, and her head disappeared behind it. I realized I wasn’t staring at bubblegum. I was staring at Gwynnie’s insides! I saw yellow organs clinging to the glistening pink flesh. Something long and gray twisted out of her mouth, wrapped around itself. Dark purple lungs slid over the drooping tongue. And then her red heart—so red, so startlingly red—plopped from her open mouth, throbbing, throbbing steadily, throbbing wetly. “Ohhhhh.” I uttered a long moan of horror. But I couldn’t turn away. Couldn’t take my eyes off Gwynnie as her insides poured from her mouth. I stood there. Stood there and stared in amazement and cold horror at the pulsing, quivering organs clinging to the oozing pink flesh. Stood there watching Gwynnie—until she had turned completely inside out. And then I opened my mouth in an endless scream. My scream rose like a shrill siren. Gwynnie—inside out Gwynnie—quivered in front of me, quivered and pulsed. The sound of my scream seemed to make her quiver harder, quiver like a mound of pink and yellow Jell-O. And as I screamed, a white light flashed around us. So bright, I closed my eyes and still saw it. Such a bright white, blinding white. My scream cut through the whiteness. Gwynnie vanished inside it. The basement vanished too. I sank into the white, into the shrill wail of my own cry. And when I opened my eyes, I stared up at a white ceiling. A white ceiling light. White curtains over a half-open window, revealing gray clouds. My throat ached. I cut off my scream. I blinked into the new whiteness. And Mom’s face floated into view. “Marco? Are you waking up?” she asked softly. Her lipstick was smeared. Her eyes were bloodshot. I saw dried tear tracks on her pale cheeks. “Waking up?” I choked out, my voice hoarse and sleep-clogged. “You’re going to be okay,” Mom said, patting my chest under the blanket. I glanced around. I was lying on my back in a bed. In a small room. A hospital room. “Marco, you were dreaming,” Mom said. “It—it was so frightening,” I sighed. She kept on talking, but I didn’t listen. I was thinking hard. And feeling so happy. All a wild, frightening dream. It never happened. None of it. And now it was over. And I was going to be okay. I felt so great, I wanted to leap up from the bed. I wanted to shout and cheer and jump for joy. But then I gazed over Mom’s shoulder to the door. “Noooo!” I uttered a horrified cry. Gwynnie was real. Gwynnie was alive! And she was coming for me, hurrying across the room to get me, an evil gleam in her eyes! I let out a scream. I struggled to climb up. But the sheet and blanket were tucked in too tight. But I suddenly felt dizzy. As if my brain were spinning inside my head. I felt so confused. I didn’t know what I remembered and what I’d forgotten. “How much is four and four?” Gwynnie demanded. Gwynnie was twice my size. “But he’ll be stupid,” Gwynnie insisted. I let out a growl. I wanted to jump up and punch Gwynnie. But the sheet was too tight. And I felt too weak. My head throbbed. Pieces of my dream kept flashing back into my mind. Once again, I saw Gwynnie down in the basement, turning inside out. I saw her pink and yellow insides quivering like a pile of Jell-O. And I saw Keith, sitting on my bed. So calm and relaxed, as if the bedroom was his! “Of course he does!” Gwynnie cried. “Huh?” I stared at her in horror. She laughed, as if she had just made up the funniest joke. “Sorry,” Gwynnie said to me, still grinning. I settled back on the pillow. “The dream… it seemed so real,” I murmured. “But—when can I go home?” I demanded. I really wanted to get out of that hospital bed. For one thing, the tight sheets were strangling me. And I knew I wouldn’t have such weird, disturbing dreams in my own bed. “Gwynnie—!” Mom shoved Gwynnie down the hall. “Nine!” I called after them. I stared at the doorway for a long time after they left. Then I stared at the ceiling for a while, counting the white squares. My head throbbed. But I started to feel calmer. The room stopped spinning. I shut my eyes, and I guess I fell asleep. The next thing I knew, I felt someone gently tapping my shoulder. I opened my eyes to find a young doctor in a white lab coat staring down at me. He didn’t look anything like the Dr. Bailey in my dream. He had wavy blond hair and bright blue eyes. He was young and tanned. He looked like an actor—a TV doctor—not a doctor in real life. The doctor reached in with his right hand. He grabbed my tongue. And started to pull it. “Hey—!” I tried to protest. But I couldn’t speak. His fingers tightened their grip on my tongue. And he pulled harder. Stop! You’re hurting me! What are you doing? That’s what I wanted to shout. Dr. Bailey tugged hard on my tongue. It slid out of my mouth, as long as a hot dog. I struggled to squirm away. But he held my chest down with one hand while he pulled my tongue with the other. My tongue was a yard long. It drooped down the side of the bed. Dr. Bailey reached deeper into my mouth and pulled. Yard after yard. My tongue curled on the floor, wet and pink. I tossed my head back and struggled to breathe. As the doctor pulled… pulled more tongue from my open mouth. My tongue piled up like an endless wet snake on the floor beside the bed. Humming to himself, Dr. Bailey continued to pull. It’s a dream, I told myself. Another frightening nightmare. I shut my eyes tight and willed myself to wake up, to lift myself from the dream. Wake up, Marco! Wake up! Wake up! And stared up at the white squares on the ceiling. I pulled myself onto my elbows. Sweat poured down my forehead. My head throbbed. “Dr. Bailey—?” I choked out. Blinking away my confusion, I glanced around the room. The white curtains fluttered over the half-open window. A bed against the far wall stood empty. I was all alone in the hospital room. I glanced down at the floor, expecting to see a pink coiled pile of my tongue. No. The floor was clean. I moved my tongue against my teeth. My normal-sized tongue. I uttered a long, relieved sigh. I’m okay, I thought. And I’m awake. I’m finally awake. I heard heavy footsteps in the hall. I turned to the door in time to see a giant enter the room! The man smiled at me and rubbed his stubbly black beard. He had to be at least seven feet tall! He ducked his head as he stepped into the room. He had bushy black hair and thick black eyebrows that looked like caterpillars floating over his eyeglasses. His white lab coat hung loosely over his long body. A stethoscope bobbed against his broad chest as he walked. “Uh… are you the real Dr. Bailey?” I blurted out. He sat down on the edge of the bed. The mattress sank under his weight. He studied me with his eyes for a long moment. “Yes, yes. I’m a little troubled by these dreams of yours,” he said finally. He placed the end of the stethoscope on my chest and listened for a few seconds. “Heartbeat is completely normal,” he reported. I nodded. “They were scary. And they seemed so real. The colors were so real. And…” I didn’t know what else to say. “So I have to stay here one more night?” I asked, disappointed. He climbed to his feet. Standing so close to me, he appeared to be a mile high! “Thank you, doctor,” I said in a tiny voice. I couldn’t hide how upset I felt. I really wanted to get out of that hospital. Dr. Bailey turned at the door. “Oh. I almost forgot,” he said, shaking his head. I thanked him again. I watched him duck his head as he made his way out into the hall. Then I examined the envelope. It said FOR MARCO on the outside, in a handwriting I didn’t recognize. Please hurry home. It’s time for you to start taking care of me. I’m waiting for you in the basement. A few minutes later, Mom and Gwynnie walked into the room. “We brought you a treat,” Gwynnie announced. She handed me a Milky Way bar, my favorite. “Aren’t you going to eat the candy bar?” Gwynnie asked. “But it’s your favorite!” Gwynnie insisted. I knew what she wanted. She wanted a bite! I reached for the letter. I had set it down on top of the blanket. I fumbled around the bed for it. I sat up and searched. Had it fallen on the floor? No. I didn’t see it there. I lifted the pillow and peered underneath. I tugged up the sheet and blanket and searched in the bed. Mom and Gwynnie exchanged glances. “But I’ve got to find that letter,” I insisted. “Your candy bar is melting,” Gwynnie said. That night, I tried not to fall asleep. I didn’t want any more nightmares. I didn’t want to see that boy Keith again. And I didn’t want to see my sister or anyone else opening their mouth and turning inside out. I kept my eyes wide open and stared at the gray sky out the window. And listened to the sounds of the hospital outside my room. But I fell asleep, anyway. And slept hard, without a single dream. When I awoke the next morning, Mom and Gwynnie were already in my room. Mom was packing my bag. I groaned and pulled myself up on one elbow. “Great!” I cried, my voice still hoarse from sleep. My head ached. My hand shot up to the bandage on the side of my head. I lowered my legs to the floor. I felt a little dizzy, but I stood up. “Dr. Bailey says you can go back to school as soon as you feel strong enough,” Mom said. She didn’t have to tell me twice. I practically dove into my clothes. I was so happy to be going home, I wanted to sing and dance. I even hugged Gwynnie, for the first time in my life! “I’m sorry I dreamed you weren’t my sister,” I told her. When we arrived home, I kissed the front door! I was so happy. I’d only been away for two days—but it seemed like two years! Mom got to work in the kitchen, making a homemade pizza. My favorite food. Mom puts lots of cheese on her pizza, and slices of hot dogs instead of pepperoni. She usually makes a pizza only on weekends. But today was a special day, a day to celebrate. Jeremy came over that afternoon. He apologized for hitting me in the head with the bat. I told him I didn’t even remember how it happened. I struggled to remember. But it didn’t come back to me. “I’m really sorry, Marco,” Jeremy apologized again. “Maybe you knocked some sense into him!” Gwynnie replied from the den door. I think Gwynnie has a crush on Jeremy. She’s always showing off when he comes over. Mom usually doesn’t let us watch movies in the middle of the afternoon. She says it’s bad for our eyes. But today was a special day. Homemade pizza and an Indiana Jones movie. It doesn’t get much better than that—right? The three of us sat in the den, eating slice after slice and watching the movie. Mom kept interrupting every few minutes to ask how I felt. But near the end of the movie, my head started to ache. I felt tired and a little shaky. I decided I’d better take a nap. I said good-bye to Jeremy and told him I’d call him later to go over our homework. Then I went up to my room. With a weary sigh, I sat down on the bed and pulled off my sneakers. Then I tugged down the covers. I started to climb into bed—but I suddenly had the strange feeling I was being watched. I turned away from the bed—and saw a boy leaning in the doorway. No. As he stepped into the room, I recognized him. Trying to make him disappear. But he crossed the room steadily, slowly, his dark eyes locked on me. I pinched my arm. I scratched my cheek. I was awake. Definitely awake. Not dreaming. Still smiling, Keith shook his head. “I’m real. Touch me.” He held out his arm. I hesitated. Then I reached out slowly… slowly… and squeezed his hand. “Hey—!” I jumped back. He was real! “But in my dreams…” I started. I didn’t like the cruel expression on his face. I didn’t like the way he was talking. He was trying to frighten me, I suddenly realized. My heart thudded in my chest. The side of my head began to throb. I took a step back. My legs hit the edge of my mattress. And I tumbled onto my back on the bed. Keith quickly stepped up in front of me, blocking my way, keeping me from climbing to my feet. I squirmed to the side and tried to jump up. But he was too fast for me. He moved quickly to block me. I stared up at him in fright. “No. No way!” I repeated shrilly. “You’re going to do whatever I say, Marco,” Keith insisted. He leaned over me, threatening me. “Go away! You don’t belong here! You’re frightening me!” I blurted out. “Get used to it!” he hissed. He leaned closer, so close his face was nearly touching mine. “Nooooo!” I let out a horrified howl. And spun out from under him. I dropped to the floor on my knees. Then I scrambled past him and jumped to my feet. He whirled around, and I saw the anger in his dark eyes. He uttered a fierce growl. “Where are you going, Marco?” he demanded. He pounced. Like an attacking animal. I dodged away from him. Then I staggered backwards to my desk. If only I could get to the bedroom door. But he hunkered in the middle of the room now, panting like a wild creature, his eyes blazing. With another low growl, he started toward me again. I searched the room. Searched for a way to escape. Searched for a weapon. Something to keep him away. He dove for me again. I leaned back against the desk. My hand tightened around a paperweight. A big, heavy stone owl that Gwynnie had given me for my last birthday. As Keith leaped, I swung my fist with the owl paperweight. And slammed Keith in the head with it. His dark eyes bulged in shock. His mouth dropped open, but no sound came out. He slumped to the floor. Collapsed in a heap. And didn’t move. He didn’t move. His eyes stared blankly up at the ceiling. I let the heavy stone owl drop to the floor. And then I crouched down beside the still body. I shook his shoulders. His head bounced on the carpet. His eyes stared up at me glassily. They didn’t blink. “Nooooo!” I let out another terrified moan. And jumped to my feet. The room spun around me. The floor tilted and bobbed. My head throbbed. I stumbled to the door. I planned to call Mom for help. But I turned back before I reached the doorway. And saw Keith start to change. “Huh?” I uttered a gasp. And stared down at him in shock and horror. His features—his eyes, his nose, his mouth—melted into the flesh of his face. Then his head slid into his neck. Like a turtle pulling into its shell, Keith’s head disappeared into his shoulders. His arms and legs slid into the trunk of his body. The skin on his body glimmered and turned milky, like the skin of a snail or a slug. As I gaped in shock, the body began to wriggle across the carpet. It flopped wetly, heavily toward me. I gasped as I saw the thick trail of yellow slime it left on the carpet behind it. And then, before I could force my trembling legs to move, the spongy, wet creature rose up. And wrapped itself around my waist. “Unnnnnh.” I let out a sick groan of disgust. Its sour aroma shot up to my nostrils, choking me. Its sticky wet flesh tightened around me. I opened my mouth to scream for help. But it choked off my air. The odor… so foul and heavy. Wave after wave of it washed over me like some kind of poison gas. I tried to kick the creature. But my sneakers sank into the soft, gooey slime. I punched with both fists. And tried butting it with my head. My punches made wet SQUISH SQUISH sounds as my hands disappeared into the spongy body. It was like battling a slimy, sticky sponge. But the foul-smelling goo stretched. Stretched over me. Over my face. So warm and sticky. Pulsing. It wrapped around my head. Covered my face. Covered my nose. The warm, sticky slime slid up my nostrils. I—I can’t breathe! I realized. I’m going to suffocate inside this thing! I knew I didn’t have much time to free myself. With a burst of strength, I swung my head back. But the warm goo moved with me. Pressed tighter against my face. I could feel the sticky slime climbing up my nose, into my mouth. I had to get help. But how? I stumbled forward. Could I walk? Could I push the heaving, spongy creature with me? My heart pounding, I forced myself forward. Butting against the heavy blob, pushing, digging my knees into its flesh as I struggled to move. Yes! I took a step. Then another. Was I through the bedroom door? I stared through the creature’s milky flesh. Stared right through its thick body. The house was a shadowy blur on the other side. I couldn’t breathe. My chest began to burn. I couldn’t hold my breath much longer. I had to keep going! Pushing, butting it, forcing my legs to take another step… another step… I made my way down the hall with the creature over me. Yes. Yes. Every step taking me closer to help. And then suddenly my feet lifted off the floor. I tumbled forward. Falling! I was falling down the stairs. The sticky creature bounced beneath me, cushioning me like a foam rubber pillow. Down… all the way down the stairs. We bounced hard together at the bottom. My head jerked free from the sticky goo. I gasped in a mouthful of air. So cool and sweet. My lungs about to explode. I sucked in another long breath. And then the slime covered my face again. I tried to roll free. But it stuck to the front of my body, wrapping itself tightly around me again. I kicked off from the wall. Bounced forward. Through the hall. Into the kitchen. Mom—where are you? My desperate question. Mom—are you home? Don’t you hear me? The creature clung to my face, to my chest. Its foul odor swept over me. A wave of dizziness made me slump to my knees. I forced myself up, carrying the weight of the spongy wet creature. Across the kitchen. Peering through its glassy body. Up to the kitchen counter. And slammed it into the sharp counter edge. I backed up—and pushed forward again. As hard as I could. I drove the slimy creature into the edge of the counter. Pushing with all my strength. Then backing up and shooting forward again. Its body made a sharp squishy sound with each blow. But it clung to me tightly, clung to my face, shutting off my air. Clung to me until I could feel my strength fade away. One more try. One more slam into the counter. I shot forward as hard as I could. I heard a loud SPLAAAT. And to my shock, the spongy warm goo fell off my face. Dropped from my chest. Dropped to the floor with a heavy PLOP. Gasping, sucking in air, panting so hard, my chest ached, I stared down. And saw two of the milky slime creatures. I had cut it in two. The two halves throbbed wetly on the kitchen linoleum. They bobbed helplessly like fat insects on their backs. “Mom—” I choked out. In only a whisper. “Mom…” No sound. I couldn’t force out a sound. I reached my fingers into my throat—and pulled out a thick chunk of slimy goo. Gagging, I heaved it into the sink. I heard a voice from somewhere in the house. From the den? Was she talking on the phone? Couldn’t she hear me battering the slime creature against the counter? Couldn’t she hear me calling to her? I staggered toward the door. But I took only a step. Before I could move farther, I felt something tighten around the legs of my jeans. 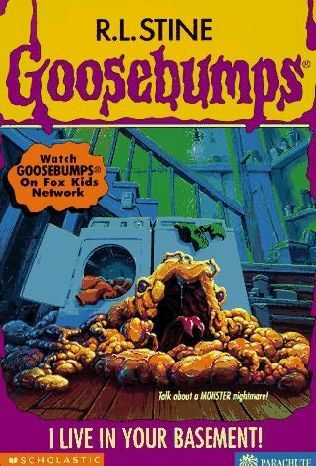 “Ohhhh!” I lowered my gaze—and saw both halves of the spongy slime creature wrapping around me. I kicked out one leg. Then the other. But they clung tightly. And stretched. Two of them now. Spreading their sticky, warm bodies up my jeans, up the front of my shirt. I grabbed at them with both hands. And pulled. But my hands slid off their shimmering wet flesh. They swept over my face. Two of them. Two of them now. I fell to my knees. Then sank onto my back. So heavy… the two of them were weighing me down. As I thrashed and slashed at them, squirming and kicking, they melted. Melted back into one. And spread around me. Pressing me inside. Until I was trapped inside. No air left… no air. And then, staring helplessly through the thick slime, I saw something move across the kitchen. Someone moving quickly. A blur of color. Could she pull me out of this disgusting creature? I gazed up at her from inside the thick, milky body. Don’t you see me here, trapped inside this goo? Staring hard at the blur of color, I saw her run up to the creature. Saw her stare down, hands raised to the sides of her face. Pull me out, Mom! I urged silently. Pull me out—now! I pleaded. Stood there and watched as my last bit of breath escaped my lungs. “Get up, Marco,” Mom ordered. She lowered her hands and pressed them against her waist. She turned away from me and walked to the sink. I heard the water start to run. I sat up and gazed around. “Hey—!” I let out a startled cry. I rubbed the floor with both hands. The floor was perfectly dry. I’m having another dream, I told myself. The glob of slime wasn’t real. Our wrestling match down the stairs didn’t happen. The whole thing was another disgusting dream. I’m not sitting on the floor in the kitchen. I’m asleep in my bed, dreaming this. And now I’m going to wake up and end it. Wake up, Marco! I ordered myself. I climbed to my feet. Mom was at the sink, drinking a tall glass of water. If this was a dream, why couldn’t I escape from it? I turned—and slammed my forehead into a cabinet. “Owww!” The pain exploded in my head, shot down my neck, my back. “I’m not dreaming,” I murmured out loud. “I’m not dreaming,” I repeated, feeling dazed. Yes. It hurt because I slammed it into a cabinet. And then I ran out of the kitchen. I had to get out of there. I had to think. I had to be alone and figure this out. “Marco—?” Mom called after me. But I didn’t turn back. I ran up the stairs and into my room. And I slammed the bedroom door behind me. “Marco, take it easy,” a voice said. I gasped and raised my eyes to the bed. Keith sat cross-legged on the blanket, the pillow between his hands. “Am I dreaming?” I asked in a tiny voice. Keith didn’t reply. He pointed to the chair. “Sit down,” he ordered. I glanced at the door. I thought about escaping. But I suddenly felt so tired, so totally weak and weary. My legs started to give way. My whole body trembled. He smiled and pointed again to the chair. His smile grew wider. A victory smile, I guess. His dark eyes flashed. He jumped to his feet and crossed the room. Then he patted me on the shoulder, as if I were his puppy dog. “Smart boy,” he said. I lowered my head. I couldn’t stand seeing that sick grin on his face. He suddenly spun away and started to the door. “Where are you going?” I demanded weakly. “Right,” I muttered under my breath. I rolled my eyes. Was he serious about this? Did he really expect me to be his slave—forever? He stopped at the door and turned back to me. “Before I go, there’s just one thing I want to show you,” he said. He took a few steps back into the room. Then he opened his mouth wide. Shiny pink stuff poured out of his mouth. For a second, I thought he was blowing a bubblegum bubble. But I quickly realized what was happening. His glistening, wet insides poured out of his mouth. Yellow organs clung to the pink flesh. His purple heart plopped out from between his teeth, pulsing inside a thick web of blue ropelike veins. I stared in horror, watching him turn inside out. And Keith opened his mouth—teeth on the outside—and he screamed too. I opened my eyes and blinked. My eyes were dry and caked. My mouth felt as dry as cotton. I must have been sleeping a long time, I told myself. Still lying fiat, I stretched my arms out. The muscles ached. With a groan, I lifted my head off the pillow. Then I raised myself up onto both elbows. “Whoa…” I murmured. The basement slowly came into focus. I felt so dizzy… dizzy and weak. I heard Mom’s voice. And then she popped into view. I opened my mouth to greet her, but only coughed. I cleared my throat. I shook my head hard, trying to shake away my confusion. I glanced around, struggling to focus my eyes. Yes. Here I was. Safe and sound in the basement, where Mom and I live. But what had happened to me? Why had I been asleep for so long? Strange pictures floated through my mind. She tenderly brushed my hair off my forehead. Her hand felt warm and smooth. “What did you dream?” she asked softly. “I—I dreamed that Marco was hit in the head with a baseball bat,” I stammered. Mom bit her bottom lip. “You dreamed about Marco?” she asked, staring hard at me. Mom sat down on the edge of my cot. “Then what happened?” she asked. She raised a hand to silence me. “I know. I know,” I grumbled. How many times had I heard this boring lecture before? At least a hundred! I raised my hand and felt the bandage on the side of my head. “Mom, please—” I tried to sit up. “I’m sorry, Mom. I’ll be careful from now on,” I promised. That seemed to make her happy. She smiled at me. I said good-night to her and watched her disappear to the other side of the basement. Then I opened my mouth and began to turn inside out. It felt so good to let my insides pour out. So clean and refreshing. My heart and arteries slid from between my teeth. My stomach was halfway out my mouth—when I heard a sound. A sound on the basement stairs! I glanced up—and saw Marco standing there. Staring hard at the figure on the basement stairs, I quickly sucked up my insides. My heart and veins slid back into my body. Then I swallowed my lungs. His eyes bulged with shock. His mouth hung open. A wave of panic swept over me. A chill ran down my back. This is our worst nightmare, I thought. I’ve been caught. I’ve been seen by a human. I stared back at Marco and waited for him to speak. It took him a long time. He gripped the banister and held on to it tightly. He squinted across the gray basement at me, squinted hard as if he didn’t believe what he was seeing. “Who are you?” he asked finally in a small, frightened voice. What should I say? How should I answer? “Who are you?” he repeated, a little louder, a little stronger. “Uh… you’re dreaming!” I called to him. He squinted harder at me.